Such a lot has happened in the ten days since I launched What Are You Doing Here? I thought the learning curve would flatten and the workload slow down after I’d launched the book. Not so. I expected marketing to take up lots of my time, and it has. I’ve arranged talks to community groups and recorded my first radio interview and started sending copies out for review. What took me by surprise was how much time and effort is involved in distribution. I was dimly aware that this could be time consuming, but I underestimated just how much is involved in processing orders, preparing invoices, packaging books and running down to the Post Office. Initially I decided not to try to get a distributor, partly because I didn’t think I could afford to and partly because I wasn’t sure that a distributor would be interested in a self-published book. I sent a copy of the book to a buyer at a large bookseller and almost forgot about it because I expected that even if they liked the book, they would not want to deal with a self-publisher. It turns out they did like the book but would be interested in taking it only if I had a distributor. How long did it take me to arrange a distributor? Slightly over 24 hours. A few days later I delivered a load of books to the distributor. What’s so great about a distributor? Far fewer boxes of books in the spare room. I know that just because the boxes are gone doesn’t mean the books are sold, but I kept my print run small, so I was never going to be left with a ridiculously embarrassing number of unsold books. Still, it was daunting seeing the boxes. No more messing with paper, parcel tape and bubble wrap and no more hanging around in queues in the Post Office. Simplified business procedures because the distributor will deal with the bookshops. I can get back to writing. This entry was posted in Self-publishing and tagged self-publishing on September 24, 2013 by janet. I love going to book launches. I’ve been to a few over the last few years—mostly local authors—but on Sunday it was my turn when I launched What Are You Doing Here? Reflections on Dementia. As a self-published author, this was very much a do-it-yourself affair—a morning of making sandwiches and savouries and chilling the wine, followed by a relaxed gathering on a perfect spring day. One of the nicest things about the day was that some of the people I interviewed for the book were able to attend. They have all been involved in caring for people with dementia, and were unstinting in their time and willingness to talk to me when I was researching the book. It was a pleasure to see them again, especially as September is World Alzheimer’s Month and the theme is ‘A Journey of Care’. I made a healthy number of sales and was delighted when the next day I made almost as many sales again. It’s starting to feel as if I’m gaining a bit of momentum. This entry was posted in Dementia, Self-publishing, Writing and tagged book launch, dementia, new dementia memoir, self-publishing on September 17, 2013 by janet. In my last post, I complained about my Kindle breaking down and said I didn’t think it was worth replacing and that from now on I was going back to paper books. I would have been quite happy to do so, but my technical advisor (husband) doesn’t like to be beaten by any piece of electronic equipment. He spent half an hour on Skype talking to a very polite, very efficient customer service person at Amazon, who concluded that my Kindle was indeed broken. She then offered several options to replace it with a reconditioned model with a full warranty at a discounted price. We decided to opt for a cheap, no frills model at a far lower price than we would pay retail for a replacement. 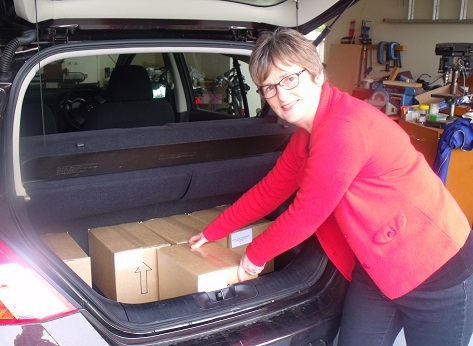 She even offered free delivery, until she realised that New Zealand is a very long way from the United States (in fact, it’s a long way from everywhere). My new Kindle arrived a few days later. Sadly, it doesn’t fit in the nice red cover I had for my old Kindle, but I now have access to the ebooks I bought in the past. This episode has made me think carefully about what I read in ebook format and what I read in print. I’ll keep my Kindle for lightweight reading and reading when I’m on the move. We asked about the expected lifespan of a Kindle, and the helpful customer service person said at least four years. It didn’t seem long to me, and I suppose we were unlucky that my device didn’t even last that long. But then, I don’t expect other electronic equipment such as my laptop to last indefinitely, although I usually manage more than four years. It made me think, though. To me, one of the advantages of print books is that you can put them on a shelf and they will still be there years later waiting to be read without the aid of any device, except perhaps, reading glasses. It seems that with ebooks, you have to be much more active in managing the hardware needed to access your book collection. What’s going to happen when large numbers of Kindles reach the end of their useful lives? Will people replace them or use tablets instead? Will today’s ebooks still be accessible in a decade’s time? Anyone else remember floppy disks? This entry was posted in Reading on September 4, 2013 by janet.